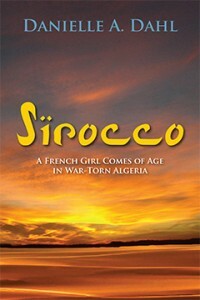 Sirocco is a finalist in two categories of the 2015 Next Generation Indie Book Awards: Memoirs (Historical/Legacy/Career) and Historical Nonfiction. On All Saints Day, 1954, the Algerian War of Independence from France begins, forever changing the lives of ten-year-old Nanna, her family, and a million-and-a-half French settlers. As Arab rebels carry out terrorist acts against civilians, hatred and bloodshed permeate the fabric of European and Muslim lives. A safe bus ride to town means keeping an eye out for stray shopping baskets containing hidden bombs. A day trip to the beach requires the protection of a military convoy. But life goes on, and Nanna’s loving mother, mischievous but good-natured siblings, and kind grandfathers provide plenty of adventure and humor. Nanna worships her Papa, who provides for his family and keeps them safe, but, growing up, she begins to understand that he is also a braggart with unyielding views of right and wrong, who believes that attending a supervised party with boys will compromise a girl’s virtue. Nanna defies him and falls in love, thus setting the stage for an ongoing clash of wills. As Nanna watches her beloved country torn apart by terrorism, she grieves for the French targeted by the fellagha and for the Arabs they slaughter because they are seen as pro-French. Ultimately, Nanna watches in anguish as the French generals, betrayed by De Gaulle, make a last stand for a French Algeria before laying down their arms. In the end Nanna’s family, like all the other French settlers, must choose between the suitcase and the grave. Danielle A. Dahl hails from a family of fourth generation French settlers in Algeria. Born and raised in Constantine, she came of age during the Algerian War of Independence. A week before Algeria celebrated self-rule and just before Danielle turned eighteen, she and her family fled their home and took refuge in France. Eight years later, she moved to the United States, where she studied commercial art. She and her husband Walter lived in Washington, D.C., Pennsylvania, and Illinois before retiring to South Carolina. Danielle has placed in several writing contests and published two creative nonfiction stories in the Petigru Review Literary Journal. Click here to find Danielle on the Web. During the summer of my thirteenth year, life went on—same as the previous one and the one before—leading us to search for entertainment whenever and wherever we could. Weekdays, Maman worked downtown, leaving my sisters and me in charge of the house chores. Each day, before preparing lunch, Zizou and I washed and dried the previous evening’s dishes and cleaned the floor. We found it faster to throw buckets of water laced with chlorine across the tiles and sweep it to the perron—the front door landing—and down the stairs. Once the floors dried, we closed the shutters and, in the penumbra, waged war on the perennial flies that, I could swear, spawned out of thin air. We sprayed Fly-Tox throughout the house to eradicate invading insects. Later, heedless of the insecticide’s acrid smell, we counted the flies lying on top of the bright kitchen table oilcloth. The flies lay flat on their backs, slender legs knitted in frozen ultimate prayers. Bodies so weightless, the slightest puff of air blown through pursed lips propelled them aloft like black snow flurries battered by crosswinds. Most interesting were the few still left alive. Frenetic legs batting the air, frenzied wings buzzing against the gay oilcloth, they struggled in tight circles to right themselves. I thought of old men with lumbago striving to get up from their benches, reaching for canes that weren’t there. To help an insect turn its world right side up, I delicately picked it up by a single iridescent wing. Sadly, it refused to assist in its rescue. It batted its legs and free wing until the one I held detached from its body and remained stuck between my fingernails. The fly fell on its back again, traced taut circles using the lone remaining wing as a pivot point, and simply died. I’m not sure why I felt guilty about killing the flies. After all, I’d seen them drink from sick eyes and runny noses, frolic among dead things, explore animal and human dung then alight on my marmalade. And there were so many of them—zillions. They drove me nuts. Just the same, I felt sad that they had to die. “Feeling sorry for dead flies?” Zizou was incredulous. My face must have shown my puzzlement. As long as I could remember, Pépé had always fished with his friend, Oscar, spending days on end at solitary beaches in Philippeville or Bône. Les Événements hadn’t changed his rituals, which infuriated Pa and worried Ma. I was so proud of him, I wanted to throw my arms around his neck and kiss him. But it was not our family’s habit to hug and we only kissed our adults to say hello, good-bye, good morning and good night. Never to show affection. In addition, no matter how thrilling Pépé’s heroic statement, kissing him on impulse would have led Papa to conclude that I preferred Pépé over him. That I was betraying him. I often thought Pépé must be tired of sharing his house with our shmala—the crowding, the noise, and the ongoing antagonism between himself and Pa. I could see how fishing would be a good excuse to get away. Before Les Événements, I too looked forward to escaping to summer camp. To getting away from the crowds. Undaunted by Maman’s reproaches, Pépé kept up his jaunts to the beach with Oscar. Once in a while, to placate my mother, he fished closer to the house, at la Rivière des Chiens. Since the start of the événements, fewer people hung around isolated spots and the Dogs’ River’s population of grenouilles and anguilles—frogs and eels—had exploded. The very sight of anguilles made my taste buds salivate like a dog’s when it ogles a marrow bone. Pépé hung the slippery eels by the gills, slit the black moiré skin from head to tail, and peeled it off inside out—like a glove—to reveal the firm, pink flesh. Once gutted, the eels were sliced into chunks, rolled into flour, and browned in olive oil till nearly cooked. After throwing in fresh parsley, minced garlic, and a cup of wine vinegar, Pépé covered the pan for the meat to simmer then served it with mashed potatoes or fried polenta. Miam, miam! There never was enough of it.